Upper left or right arm weakness can be caused by nerve damage or compression of the shoulder, repetitive strain injury of the shoulder, or a pinched nerve in the neck. Read below for more information on upper arm pain and weakness and when you should seek medical attention. Symptoms of weakness in one upper arm, whether it happens suddenly or gradually over time, can be quite worrisome. Often, acute weakness in one upper arm can be a sign of a medical emergency such as a stroke, but chronic upper arm weakness is also a concerning medical finding that requires appropriate follow-up. Difficulty performing daily tasks: Brushing teeth, combing the hair, grasping objects, etc. When discussing weakness, it is important to differentiate between true weakness and weakness that is secondary to other conditions. True weakness is defined as a decrease in muscle power a condition in which the force exerted by the muscles for any given activity is less than expected. True weakness is not weakness or difficulty moving or using the upper arm due to pain or joint dysfunction or generalized fatigue, such as after a strenuous workout or from trying a new sport . Diagnosing true weakness requires discussion and a physical examination with your physician. Make an appointment promptly if you experience any of the symptoms above in order to properly identify the cause of your symptoms. Muscle strength is dictated by a complex interplay of nerves, muscle protein, and ions that allow muscle fibers to contract and create force. Any process that disrupts this system can result in true weakness of the upper arm. Damage or disruption to the nerves that supply the muscles can result in true weakness because nerves provide the stimulation that allows muscles to contract. Without nervous system stimulation, the muscles do not contract and will waste away and atrophy . Central: The central nervous system (CNS) consists of the brain and spinal cord. The central nervous system is the primary control center for all of the tasks we perform on a daily basis. Decreased blood flow to the central nervous system (whether via blockage or hemorrhage) can result in death or permanent neurological deficits such as hemiplegia, numbness, balance problems and many more depending on the area affected. In weakness in one upper arm, the blood vessel in the brain most commonly affected is the middle cerebral artery. Other conditions that cause bleeding within the skull (hematomas) can also result in symptoms of weakness. 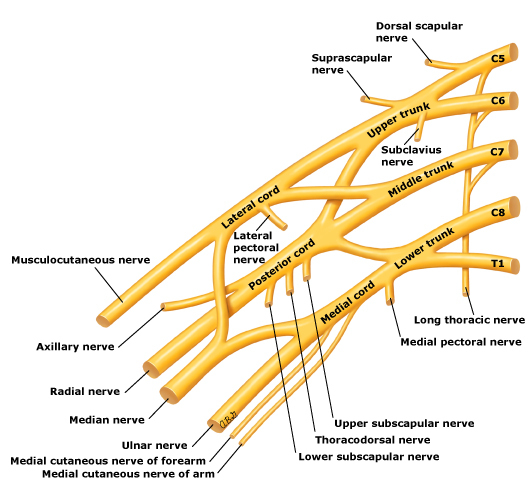 Peripheral: The upper arm is controlled by a complicated branching system of nerves called the brachial plexus. This plexus of nerves starts from the cervical spinal cord, travels down the neck, over the first rib, and into the armpit to provide innervation to not only the arm and hand but also the chest and shoulder. See an image of the brachial plexus here and here. Damage to these nerves from a variety of causes (inflammatory, compressive, hereditary) can result in true muscle weakness. A variety of conditions can damage or injure the muscles and the fibers themselves and result in true weakness. Hereditary: There are genetic conditions that cause progressive weakness and loss of muscle mass. For example, muscular dystrophy is a group of muscle diseases in which gene mutations interfere with the proper production of proteins necessary for making healthy muscles. Inflammatory: The inflammatory myopathies are a group of diseases that involve chronic muscle inflammation. Myopathy is a general medical term used to describe a number of conditions affecting the muscles. All myopathies cause muscle weakness and sometimes pain. These inflammatory myopathies can occur in autoimmune disorders conditions where the immune system attacks itself, including muscles and also from infectious causes such as bacteria, viruses and fungi . Drugs and toxins: There are many medications that can cause muscle weakness. From steroids to cholesterol medications, it is important to inform your healthcare provider of any drugs you are taking. They can also assist you in finding support if you are struggling with a usage problem. People with a variety of systemic disorders may interpret difficulties performing certain tasks as weakness. This type of weakness is more related to fatigue and is not considered true weakness. These systemic disorders include conditions such as cardiopulmonary disease, joint disease, anemia, malignancy, chronic infectious or inflammatory disease, and/or depression. People with any of these conditions may be functionally limited, and the lack of use of the affected limb or muscle may progress to true muscle weakness due to deconditioning (infrequent use of the muscle). The list below shows results from the use of our quiz by Buoy users who experienced weakness in one upper arm. This list does not constitute medical advice and may not accurately represent what you have. Treatment for weakness in the upper arm is largely focused on physical rehabilitation and therapy. The causes of upper arm weakness discussed above can have specific treatments (for example, antibiotics for certain infectious causes or steroids for inflammatory etiologies); however, once the upper arm weakness results, treatment must be based in physical therapy in order to restore strength, function, and mobility to the arm. Here are some frequently asked questions about weakness in one upper arm. Will I ever be able to use my arm? Often, in the setting of neurologic causes of weakness or systemic causes of fatigue, dedicated physical therapy (PT) and rehabilitation can help restore some function in the arm. Unfortunately, for some muscular etiologies of upper arm weakness (especially hereditary or autoimmune causes) muscle function can continue to decline despite physical therapy. It is important to realize that there are many factors that may contribute to the restoration of function such as age and severity of the disease. The mnemonic or phrase FAST is a good way to remember the signs of stroke and what to do in such a situation . Facial droop, arm weakness, and speech difficulty are all signs that it is Time to call 9-1-1 (in the USA) or another emergency responder. Strokes are medical emergencies that require prompt attention in order to achieve the best outcomes. How can I identify true muscle weakness? Will my upper arm weakness affect my daily activities? True upper arm weakness can have a profound effect on activities of daily living. Individuals with true muscle weakness often experience complete paralysis and inability to use the affected limb. For individuals with some residual function, completing daily activities such as combing the hair, brushing the teeth, writing, grasping objects, etc. can be extremely difficult without the help of physical therapy. What kind of exercises will help with my upper arm weakness? Rehearsing: Imagining doing activities without actually doing them. Constraint-induced movement therapy: This technique involves covering/occluding the unaffected arm to encourage the use of the affected limb.